As a child she was shunned from the cool cliques due to her fate as the self-described “nerdiest girl in PS 1” and unhappily saddled with the name Yip-Han as the first generation American-raised daughter of two South Chinese immigrants. Yet the young heroine of Falling For Grace begins to assert her independence firstly when she controls the checkbook as the only English speaker in her home and secondly when she discovers the lovely Grace Kelly on television. Thus she reinvents herself to become something quite close to the Philadelphia socialite turned princess as an adult. Quickly we meet up with Yip-Han 2.0, now renamed Grace Tang (Fay Ann Lee) as she continues to dutifully look after her beloved parents with subzero refrigerators and cell phones they’re unable to use. Likewise, perhaps culling from her checkbook balancing childhood, she’s since become a successful investment banker in a top Wall Street firm where she and her best friend/coworker Janie (Margaret Cho) try to maneuver their way through the male dominated concrete jungle. Still intrigued by high society in her Grace Kelly inspired quest, the perpetually Coke drinking and Dunkin’ Donuts eating adorable Grace crams for a cocktail party mixer to impress the well-to-do blue bloods and become a member on the Metropolitan Opera Junior Committee by having her good friend and cabbie quiz her on opera trivia. However, any attempt to impress with musical knowledge is long forgotten when her name is overheard and our bubbly heroine is mistaken for well-known but illusive designer Grace Tang whose Manhattan boutique Shanghai Tang has become as coveted as Marc Jacobs to the very women with whom she’s hoping to get acquainted. Caught up in their fawning and admiration, their mistake is never corrected at the party and before Grace’s mistaken identity can be rectified, she is later stopped on the street by one of the women’s fiancés she’d met during the mixer, Andrew Barrington Jr. (Gale Harold). As the handsome New York golden boy, Andrew forgoes his parent’s wishes to live a life of class and privilege by trying to make a name for himself crusading on behalf of the mistreated sweat shop workers in Chinatown in his position in New York’s attorney general’s office. And upon seeing our heroine a second time, he takes an immediate interest in Grace and their tangible chemistry grows considerably as they become tentative friends before romance enters the equation. While admittedly the film was creatively influenced by her love of romantic comedies such as The Truth About Cats and Dogs, Pretty Woman and Working Girl, theatre and television star Lee jokingly told Phoenix Film Festival audiences her initial inspiration was “lack of work." After she'd had great success starring in Broadway’s Miss Saigon before being relegated to roles such as maids and nurses in television, Lee ultimately decided that since nobody was writing for Asian American females, she would do so herself. Referencing the recurring theme from the aforementioned comedies she enjoyed of “underdogs trying to find acceptance in a world where they don’t quite fit in,” Lee’s production notes continued by invoking Working Girl, noting, "There were simply no Asian Tess McGills in our cinematic catalogue that I can think of. So, when I decided to pen my first screenplay, I wanted to create the Asian 'Tess.'" The film, which took four years to raise enough money to produce, went through numerous versions that originated with a first draft of the delightful and winning script penned by first time filmmaker and the film’s star Fay Ann Lee, which was written ten years earlier by Lee in a screenwriting class. Later, guided by her own instincts as well as those of her talented mentor Jim Taylor (Sideways), she rewrote more than seventy pages before final production. Featuring a terrific performance by Christine Baranski as Andrew’s overbearing mother, which seems to provide further proof that Baranski has cornered the market in playing uptight WASPs married to men who tie sweaters around their necks, Lee's film is also strengthened by the rest of its stellar cast. In deciding to make the Asian family in the story as authentic as possible to try to bring something new to the romantic comedy format, Lee cast actors who all spoke the same dialect to heighten the familial intimacy. 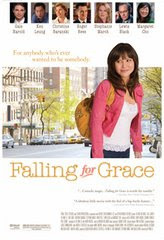 While some critics have likened Falling For Grace to My Big Fat Greek Wedding and admittedly, it does at times feel like a predictable yet sunny hodgepodge of several romantic comedy plots, I greatly admired Lee’s choice in Grace to, unlike the family in Greek Wedding, honor her family by presenting audiences with one that undeniably loves and fights for one another as opposed to just dishing up one sitcom ready one-liner after another that makes fun of the family’s ethnicity instead of embracing it. Lee’s affection for her characters definitely shines through and it’s the little details in their relationships and the terrific stars including Elizabeth Sung (as her mother), Clem Chug (as her father) and the charismatic Shanghai Kiss star Ken Leung as her brother that help move the plot along even though we ultimately know where it’s headed. The type of feel-great romantic comedy we need this spring after months of dark plots filled with vengeance and blood, Falling For Grace, which opens soon in limited theatrical release here in Arizona at the renowned Camelview 5 Harkins Theatre, seems destined for word-of-mouth success as it’s the kind of movie you’ll immediately want to recommend to others. Perhaps more importantly, it's another fine example of women wearing numerous hats as directors, writers, producers and stars to bring their cinematically independent visions to life.